Great photos for a great cause. Want wonderful wedding pics for next to nothing...literally! Enter to win the chance for free photography with the purchase of a $50 tax-deductible raffle ticket for charity. Love it when the wedding community gives back and this time they give to you, not just to a good cause (well, you might be a good cause too). Emilie Sommer of Emilie Inc. and her colleagues founded the Pink Initiative, an organization built by a collection of wedding industry professionals and private donors dedicated to funding awareness, outreach, education and research for breast cancer. And their raffle is running now through Valentine’s Day. Win 5K of wedding photography coverage for just a $50 raffle ticket! And give back to a great cause at the same time. Humm...love, good will, good odds, and a great cause - not a bad way to gift your Valentine this year. 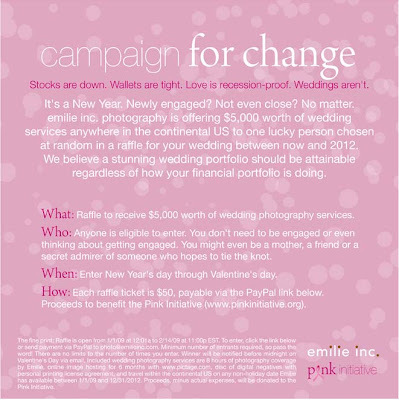 For more information on getting involved in the cause, giving to it, or getting your ticket, check out the Pink Initiative.